Talking about parenting publicly gives me anxiety. Trying to raise functioning human beings is is hard, it feels like the entire world is telling you what to do, and who knows if you’re even successful for what? 20 years? But we have managed to get one kid to 17, on the brink of a senior year, and he’s still talking to us. So I’m beginning to look back and see things we started long ago that were GOOD decisions. How lovely to take a deep breath and give thanks for the little seeds we’ve sown over the years. My sweet 14 year old niece spent the week before Easter with us. Her school does an 8th grade trip, and this year it was 60+ kids and 3 adult supervisors in Washington DC. Which is maybe 3 (or 10?) adults short of what is necessary? So my sister set up her own special 8th grade trip to the thriving urban metropolis of Lincoln, NE. Because my niece is AWESOME, she was thrilled to trade in friends and culture for 4 days with her auntie and cousins. We were delighted to have her, and this Auntie loved having a girl around for a few days. I loved tucking her in and night and praying the same blessing I’ve prayed for her all these years, the blessing I pray over my kids. Halfway through her time with us, she said, “Ray Ray, you didn’t sing my special song for me.” Well, no babe, I didn’t even think of singing a 14 year old to sleep. But on her last night, I did sing to her. And as the first words came out in my (not that great) voice, she closed her eyes and smiled THE SWEETEST SMILE. I thought my heart would burst. And I am so glad I gave her a “special song” years ago. This particular family tradition started with my niece. Despite having a 17 year old son, I was an aunt before I was a mom (because I married into being a mom, to a 5 year old.) And when I started this tradition, I didn’t know I was starting a tradition. But it has been a good one. My aunt, my father’s oldest sister and the sibling who lived closest to us, decided 13 years ago that she was done with Diabetes and dialysis and machines keeping her alive. She gave her family the gift of knowing it was the end and coming to say good bye. We respected her decision, but it was a hard, hard time. At the care center where she was dying, my sister, mom and I took turns holding my baby niece. When she was awake and happy, she gave joy to everyone in that sad place. But when she was crabby and wanting to sleep, all we could do was walk the halls. I swear I walked miles those few days, and nearly sang myself hoarse. The only song I could remember all the words to was a favorite praise song by WaterDeep. When I became Luke’s mom, I decided he needed a special song too. For him, I chose the favorite hymn of his first mom (Matt’s first wife, Julie, who they lost to cancer when Luke was 3): Holy, Holy, Holy. I can’t really pick a favorite hymn (it’s like picking a favorite book or a favorite child – who can do that? ), but when Tobin was born, I chose “Tis So Sweet”. This was a favorite from my (long) season of singleness, wanting to be a wife and mom, which felt very sweet as that hope was doubly filled in my first (and only) baby-from-my-womb. 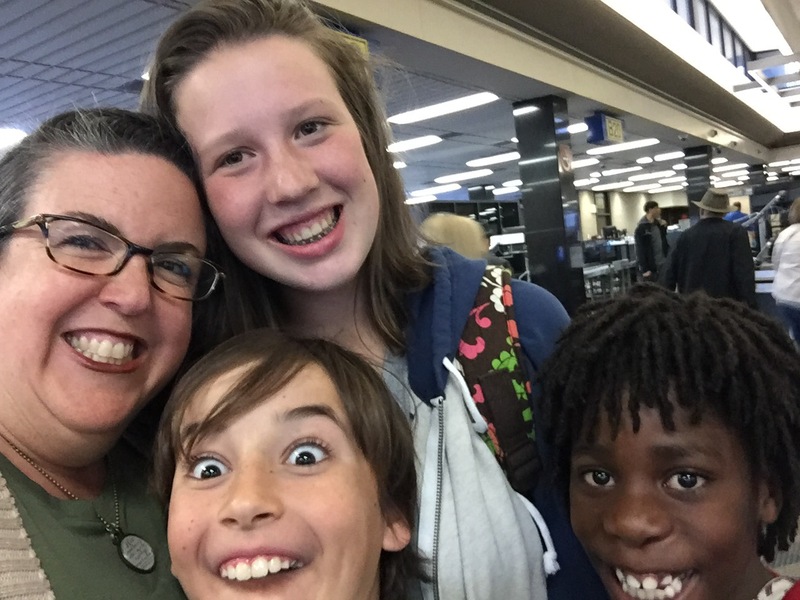 Micah’s adoption from Uganda was such a long, rocky road (as they all are), and his story (as all adoption stories are) is hard. I wanted to speak life and hope over him, so Victory in Jesus was a natural choice. To this day, when we sing any of these hymns in church, my kids recognize their “special songs” and their faces light up. There’s no way to know if the church of the future will sing hymns – but I hope so. And I know my own kids will carry at least one hymn with them, words of truth sung over them in their childhoods. What a gift. And one I’m so glad I gave. Even though they outgrew being sung to sleep years ago <sob>, I think I’ll sing their special songs for them again tonight.